It's Infertility Awareness Week. Jenny is running a great series in honor of it. In a way, this week is a relief, because it reminds me that we aren't alone in our struggles with subfertility. In fact, I feel blessed when I realize things could be much, much more difficult. When we got married, I wasn't sure if we would be able to have children. My parents had battled infertility for many years before being blessed with my twin sister and me. Since these things are usually genetic, I figured that biological children wouldn't be a given for us. But I hoped and prayed we would be blessed with babies! Only six (seemingly long!) months into our marriage, we were blessed with Therese. When Therese was about 6 months old, we were once again open to pregnancy (I mean, even when we're trying to postpone pregnancy, we're always open to life, but we were being more intentional about it). After a year and half - including a diagnosis of mild PCOS (polycystic ovarian syndrome) and medication to help treat that, we were blessed with our little Maria. And now, again, we've been open to another pregnancy for a while. We are definitely hoping to have more children! Yet, again, it seems as if we may have a bit of a journey ahead of us. Now, granted, having two little girls who are less than three years apart, and having been able to conceive in our first year of marriage...I don't know that I would call that infertility. I would definitely call it subfertility. Pregnancy just isn't a given for us, and even when we are blessed with a baby, hyperemesis gravidarum tends to make pregnancy a challenging time. After Therese, I assumed that we would be able to get pregnant within six months to a year. When that didn't happen, it made me realize that subfertility would just be a part of our lives. Now, aware of that, I'm in less of a rush for Maria to move past babyhood. I'm soaking up every minute of it. Therese wasn't weaned until she was two, but that wasn't intentional...it was just how things worked out. This time around, I'm in no hurry to wean Maria, because I know that weaning her isn't a guarantee of being able to conceive again (I was still nursing Therese when I became pregnant with Maria, so nursing doesn't seem to prevent that for me), but I also know that another future baby to breastfeed2 isn't a given. Maria will be weaned soon enough, but in the meantime, I'm soaking up this time we have together. The first wave of pregnancy announcements post-Maria didn't hit me at all. She was still less than a year old, a baby. This second wave has hit me harder. I don't even know if our child spacing would bother me so much, if I weren't surrounded by so much...fertility! I don't want to be that friend. I don't want to be the one that people avoid because I'm struggling to get pregnant. (Honestly, knowing what a cross hyperemesis gravidarum is, I'm still really nervous about future pregnancies, anyway.) If you're pregnant, tell me! I really do think it's awesome news! What I'm afraid of is treading on the jealousy path. You know, the path where you forget to be grateful for the good you have and begin to wish others didn't have so much good in their lives? Guilty as charged. Then, recently, in prayer, I felt as if God gave me a grace. The grace to be grateful. I'm so grateful because, even if things aren't always timed the way I would like (and even though HG is a part of my experience of pregnancy) I do have these full arms. I have two incredibly beautiful, precious little girls. I'm only 28 years old, and already I have two children! That is a blessing. And do you know what...they are each a blessing. Their personalities, what they contribute to our family...it is priceless. I think of my own parents, who were only blessed with two girls, and I realize that they never complained about that. Instead, they were filled with this constant gratitude that God had blessed them with not one but two children! I think their example has helped me to have a better attitude. Children, I've begun to realize, aren't something I can demand. They aren't a right. Just because my friends have many, doesn't mean that they are more worthy than I am. It just means that God has a different plan in mind for them. In the meantime, God has given me these two amazing daughters, and I don't want to get so lost in longing for more that I miss that. Does that make the aching go away? I wish it did. It is normal and natural for a mother to desire babies. But it does help to put the aching in perspective. It's alright to ache for another child, but it's also alright for my heart to be soothed by the two that I do have. I know that my experience may be different than someone suffering from total infertility, but I think that it's important to remember that subfertility is very real, and very painful, too. Too often, I think that people see Catholic couples with children spaced far apart and judge them for it, not knowing that that couple may be wanting many more babies than they've been able to have. Be sensitive in what you think and say! 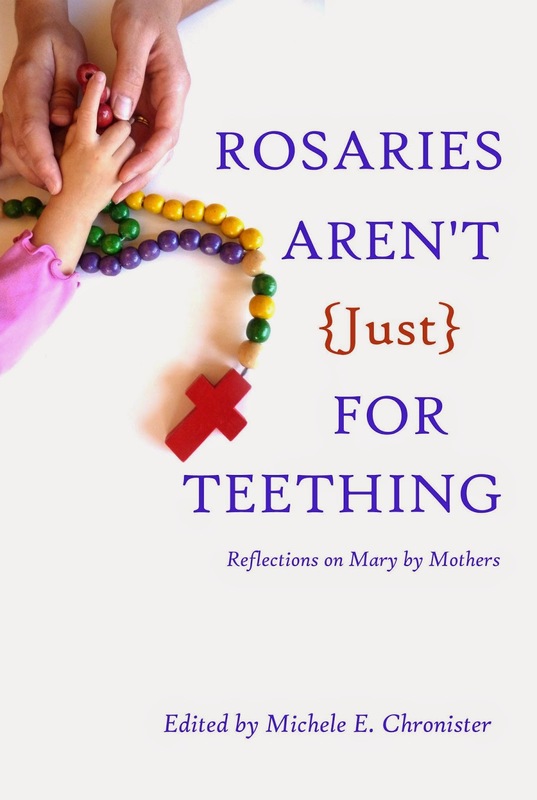 Stay tuned for pre-order information on Rosaries Aren't Just for Teething. Pre-order should hopefully be available by the end of the week! Interested in winning a free e-book copy? Haley of Carrots for Michaelmas is currently giving away one! Go check it out! I have several friends who are struggling or did struggle to have babies. It's so hard to know what to say, to know how to be a good friend. Thank you for sharing honestly about what it's like to be in your position. Your girls are beautiful (and the yarn picture really cracks me up - especially their expressions!). Beautiful post! The pictures are great, too. I especially love the one with the two girls and the yarn. Your daughter's face is priceless. May God bless you soon with another little one! I can completely relate. I am 35 weeks along with baby number two who will be born a month before my daughter turns 3. We didn't plan on such a big gap in age and were asked frequently when we would have another by friends, family and even strangers while waiting to conceive. It can definitely be hard when people assume you are preventing because you don't have 3 under 3 like so many other Catholic mamas in your parish. Glad to know I am not the only Catholic mama dealing with subfertility. After having my sister and me right after marriage in her early twenties, my mom struggled to get pregnant for almost 8 years. While they were grateful for their three children, my parents (mom especially) had always hoped for many more. 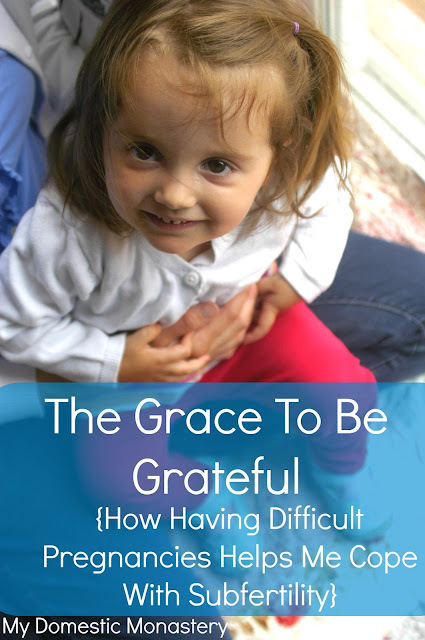 I think watching her journey with fertility firsthand taught me not to take the gift of children for granted. My husband and I have been blest so far with three children pretty close in age but my heart goes out to you. It is a very hidden cross you carry. Michelle, thanks for sharing. When people ask about my children's spacing, I always say, God's plan, not ours." My first two are four years apart, and my boys are five years apart! We lost a daughter between the boys. It's hard being in very Catholic, pro-life circles with subfertility. I can often feel the stares and the sizing me up, I can almost read their minds as they wonder if I'm contracepting. I get frustrated having to explain. I am very blessed with three miracle babies who really are only here by God's grace. As I head into my 40's (eek!) I'm sad that my baby days are most likely over. I will always be praying for more even though I am so thankful for the ones I have. God bless you. I found my way here from 7QT and just wanted to say thanks for sharing your story. Your girls are beautiful! I struggle with total infertility, but you're right, just because your struggle is different doesn't make it less real or painful. Praying for you! And what a beautiful post. I can relate to so much of it, since we are also subfertile. (Although I've never actually starting "trying" until closer to 1.5-2....I've never had any desire for super closely spaced children). I think being subfertile is sorta a "unique" camp to be in..and one that's not talked about much. And it is so hard being around so many families that are very fertile and have many children close together. My youngest is 2.5, so it seems as though just about everyone I know who had a baby around the same time, already had another baby since then, or is pregnant. And that IS hard. You are so right in that children aren't something you can demand...they aren't a right to have and EACH child is a blessing and it's important to be grateful for each child. Thank you for sharing this! I'm new to your blog but have been very blessed by it. I fall under the "married six months and still not pregnant category". I (and everyone around us) expected for my husband and I to be expecting a few months into our marriage. We're still waiting on God's timing though, which hasn't been as soon as we hoped and that is a challenge for me at times. Thank you for your thoughts, they really encouraged me.